Come and join us — whether you’re from the city or the country, work in early childhood, libraries, child and family services, volunteer in a Service Club, or you’re a strategic planner in your government position. 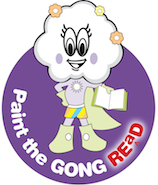 Or if you just want to learn about how to get started painting your community REaD. We’ll share great ideas, have fun, plan new strategies, as well as enjoy the Gong’s seaside hospitality. So start thinking about whom you’d like to invite, what you’d like to find out and what you’d like to share. Download Advance Notice pdf here.